Hi, this is the Aqua redesign art that i did. This art is really difficult and challenging to make. Firstly, it is quite time consuming to draw so much details and i have been burning lot of midnight oil for it. Secondly, the design stage take a long time. I look through alot for reference. 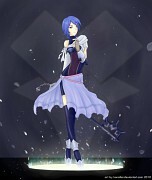 Like how to draw Aqua realistically and also the dress for her. I actually plan to draw her with long hair, but i thought she may not look like Aqua if I did that so i didnt. Initally i wanted a halloween theme since halloween is coming soon but i think the colour theme doesnt work that well with her. So i think of something really cute and all... And i did draw alot of dresses for her but i settle with this. I also try lot of colour combination but i think Blue suit her the best. Thirdly, i meet with lot of obstacles while doing it. Workload stress and also my external hard disk broke.. I lost all my other artwork source file but amazingly, i didnt save this file on my broken hard disk. 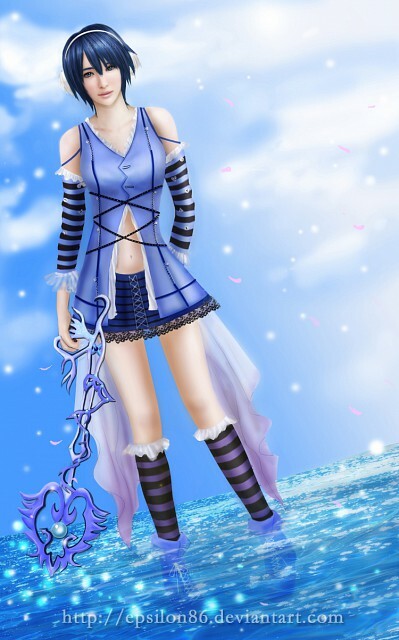 Lastly, the background and the keyblade. The keyblade is a challenge by itself since i seldom draw weapons and all. The background is a random idea i have. I hope you will like this art.